We've all had these days as parents. Hopefully this handy guide can help get you through your next dinnertime. 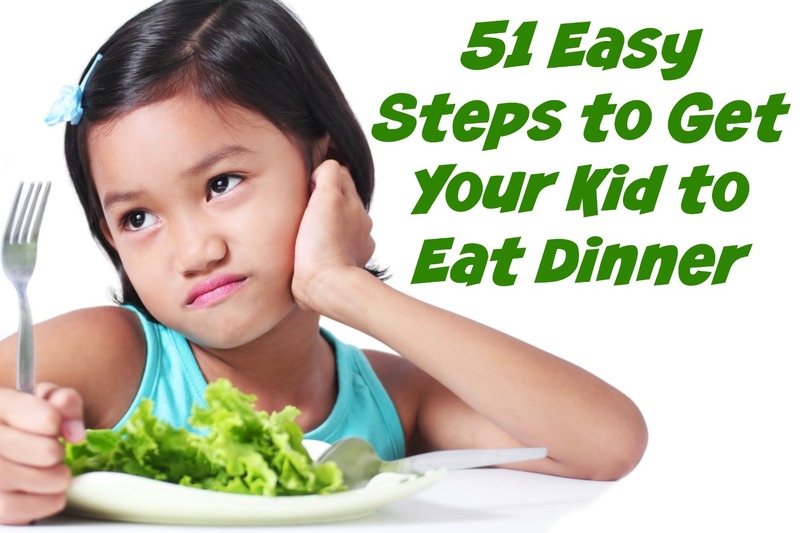 Just remember these 51 easy steps to get your kid to eat! 1. Start cooking a healthy dinner for your family. 2. Remember your child refuses to come within five feet of one ingredient you used in the dinner and child will use their special abilities to sense that ingredient. 3. Throw chicken nuggets in the microwave for your child to eat instead. 4. Call your family to dinner. 5. Call your child to dinner. 6. Put food on the table. 7. Call your child to dinner. 8. Ask your child where their pants are and tell them they can’t come to the dinner table with no pants on. 9. Tell your child to go wash their hands. 10. Dish up plates being careful not to let any food even give the appearance as if it has touched any other food. 11. Bite your tongue when your child says they don’t like dinner before they actually know what it is. 12. Sit down with your family to eat. 13. Tell your child to go wash their hands with soap this time. 14. Tell your child to sit down and eat. 15. Go get your child the “correct” superhero cup to drink out of. 16. Say a silent prayer begging for your child to actually eat dinner this time. 17. Think about taking your first bite of food. 18. Tell your child to sit down and eat. 19. Go get washcloth to clean up spill on the table. 20. Tell your child they can’t have seconds until they eat their vegetables. 21. Go get dog to clean up vegetables on the floor. 22. Think about taking your first bite of food again. 23. Tell your children to stop touching each other. 24. Remind your child that they ate the same vegetable two days ago and loved it. 25. Threaten to show your child video evidence of them eating the same vegetable two days ago and loving it. 26. Take first bite of lukewarm food. 27. Tell your child that they aren’t done with dinner after three bites and may not be excused. 28. Tell your child to sit down and eat. 29. Ask your family what their favorite part of the day was. 30. Tell your child that stealing the toy from their sister doesn’t count. 31. Reassure your child that the microscopic spot on the vegetables is not poisonous. 32. Go heat up your food in the microwave. 33. Tell your child that they won’t get dessert if they don’t finish their dinner. 34. When your child asks what is for dessert, respond that it’s a surprise. 35. Search around for something resembling a dessert that you hadn’t planned on serving. 36. Find hidden stash of leftover Halloween candy from 2012 for dessert. 37. Tell yourself that your dinner is just as good cold as it would have been hot. 38. Open vegetable negotiations with your child. 39. Make mental note to Google "how to register for debate classes at local college." 40. Wipe away tears on face from intense negotiations. 41. Wipe child’s face as well. 42. Decide your child must eat four out of seven pieces of vegetables. 43. Go get candy and put it on a plate by your child as motivation. 44. Go to mental happy place when child starts gagging. 45. Resort to feeding your child like a baby with airplane noises included. 46. After three pieces of vegetables, realize it will take approximately two hours and forty-seven minutes for them to eat the last bite. 47. Let them have half the dessert, convince yourself it’s a victory for you, and have them get ready for bed. 48. Eat the other half of dessert yourself. 49. Tell yourself you will have more willpower tomorrow. 50. Open up a bottle of wine and pour yourself a glass. 51. Put glass aside and drink straight from the bottle instead. There you have it. Dinnertime is so much easier now, right? Just remember, “This too shall pass.” Or so people who don’t have small children at meals like to tell you. Which steps did I forget? Let me know in the comments below! Oh gosh I hope this isn't what's in store for me! My son will be 2 next month and he is HORRIBLE with food. He down-rite REFUSES to eat anything that's not sweet! Every now and then he will eat a few chicken nuggets or some mac and cheese but no other foods have ever gotten past a taste. I thank God for toddlers vitamins, and fruit! Oh god. Both funny AND painful to read. Been there, still there. Pass the wine! Now that we're just past the 1 year mark, I'm starting to see these steps take place more and more. Except for #50, I'm a bourbon or beer guy most of the time! Much funnier when reading about it than when going through it. I know! Good stuff Beau. Thanks Larry, I know every parent goes through this at some point! Whatever gets you through R.C. I think by the time my oldest son is out of it my youngest son will be there. Thanks for reading Brent! Hopefully you can continue with that. I have three kids and sometimes you just have days like this! This garnered a true LOL from me, though I likely won't be laughing in about 6 hours while it's happening in my house. Great post, Beau. Jay its always funny, until you're in the middle of the battle! You're right Neal, it really is an organic process. Sometimes you run through all 51 steps 2-3 times in a day (or even night)! You must live in my house because this is precisely what goes on! Painful (and funny when it's NOT dinner time!)! Thanks Justin! Glad to know I'm not alone.